I hate to admit it but I’m not getting any younger. And part of that, other than a bad back and shouting at teenagers on the lawn … (OK maybe not), is that it gets harder and harder to drop a few pounds when the pants start getting too tight. . I always eat my veggies, but now I’m starting to pay more attention to the grains I eat. Oh, I have an arsenal of whole grain recipes but so far I’m having a problem giving up my beloved basmati. I’ve found switching to whole wheat berries / spelt / rye berries isn’t difficult, it just takes some time. In a pot on the stove top wheat berries can take 40 minutes or so. If you have a rice maker, it may take up to 75 minutes but then it’s completely hands off, leaving you to do other tasks. Another benefit of using a rice cooker is the fact that most rice cookers will keep the cooked grain warm after cooking. 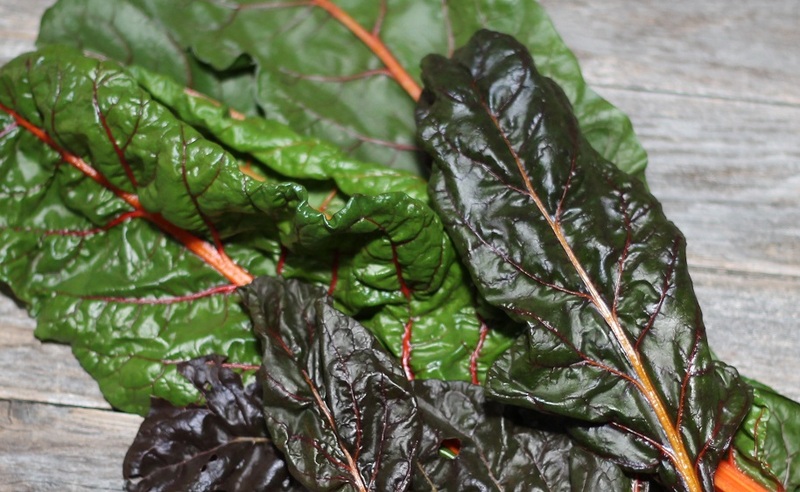 Rainbow chard is beautiful vegetable that looks so good it is often used as an ornamental but make no mistake. It’s delicious to eat too! I figured a stir-fry with chopped cashews would make a satisfying light dinner, and substituting wheat berries for white rice would add a little substance and some fiber and bulk to the meal. 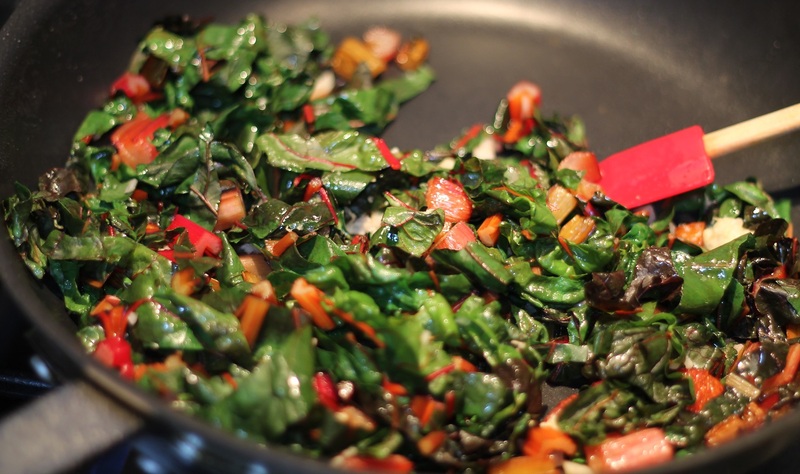 A relatively fast (well, less than an hour) dinner to get on the table, full of nutrition from dark green leafy rainbow chard, fiber (24 gm per cup!) rich wheat berries, and crunchy chopped raw cashews flavored with garlic, ginger, and fish sauce. This is a healthy taste explosion! 2 servings cooked grain – rice, wheat berries, spelt – whatever you like. Remove lid and stir occasionally allowing rest of water to steam until pan is nearly dry. 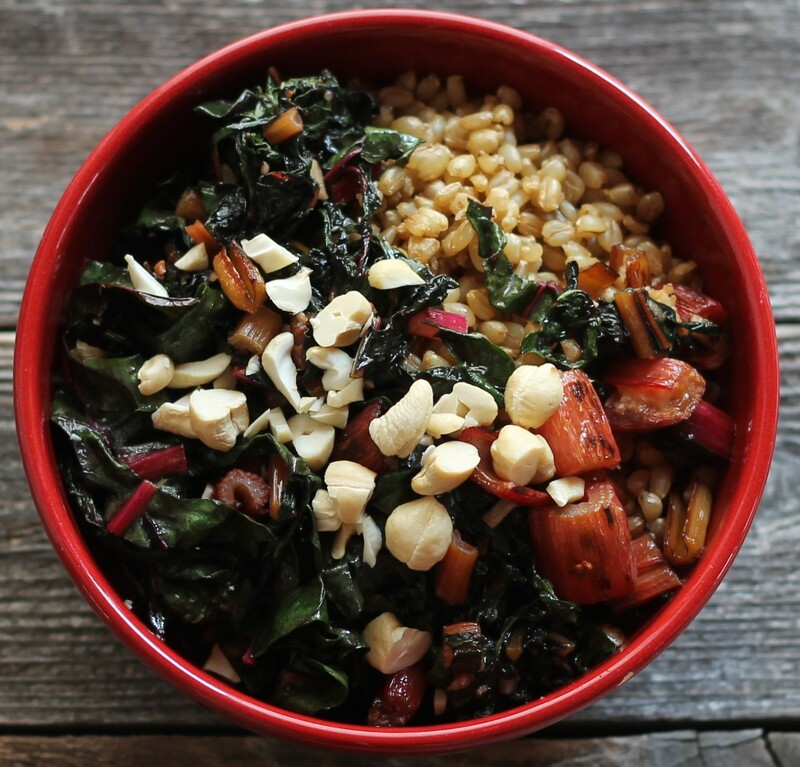 To serve, put some grain an a bowl, add cooked chard stems and leaves, top with chopped cashews. Crunchy, chewy, salty with unami – super simple yet delicious! Yes, I’d enjoy that too (without the fish sauce). However, a big serving of cashews will not help you to lose weight, will it? We have a rice-cooker and use it very frequently. We had one that doubled as a slow-cooker but that part of it was rubbish and it was seldom used. An eighth of a cup of cashews won’t be a problem Mark. I’ve wondered about those cookers.